Mirna is a force of nature and I’m so excited and grateful to be able to bring you her story, her voice, and her mission of empowerment, body positivity, and adventure. We cover so much in this week’s new episode, I don’t even know where to begin! On this week’s episode we chat all about Mirna’s love for running and adventure, and why curiosity is an essential part of our growth. Mirna shares with us the epic race she just completed - the Transrockies Run, a six day stage race covering 120 miles across the Colorado Rockies - and how her perseverance, spirit, and community lifted her up and pushed her to the finish line. She opens up about living her life publicly and how being vulnerable has inspired others to push outside of their comfort zones and choose adventure too. We also chat redefining athleticism, the inspiration behind her blog Fat Girl Running, the REI documentary, and her book A Beautiful Work in Progress. Mirna shares with us how she deals with negative comments, why it’s so important to embrace the body we’re in, the challenges she’s taking on next, and SO much more! Mirna fell in love with running in high school, but ultimately it was a health scare that pushed her back into running. She started slowly and worked herself up to 5ks, half marathons, and eventually she ran her first marathon in 2011. She loved the experience of training and how it made her feel, and she kept pushing herself. Mirna isn’t just a runner, she’s an ultrarunner - someone who runs marathons longer than the standard 26.2 miles (they’re usually 50-100 mile courses . . . like, WHAT!?) Over the years Mirna has completed several marathons, ultramarathons, and obstacles races. She is truly a force and an incredible inspiration to so many - runner or not. In 2013 Mirna ran her first ultramarathon, and she’s been hooked ever since. 2011 was also the year she started her blog, Fat Girl Running. It was a way for her to chronicle her training and share stories with friends and family about running long distances in her body. It was a way to connect with others who were also pushing their bodies and their minds beyond what they believed was capable for themselves. Over time her following grew, and people were tuning in week after week to read Mirna’s thoughts and reflections. It’s become part of her lifestyle finding ultramarathons, marathons, and super long distance events. It’s about testing her body, testing her mind, seeing what she can do and how far she can push herself. What motivates her? Curiosity, pure love of sport, running trails, being outdoors, and challenging herself. Mirna is a full-time adventurer, and she loves being out in nature for hours at a time and getting lost in the trails. For her, curiosity is an essential part of adventure and pursuing our goals. We have to be willing to look around and explore possibilities - no matter the goal or the circumstance. Mirna’s words on fear and failure, and why it’s been important for her to show people that they can have fear, and you can fail, but you can still keep living and trying new things - will encourage you to do the same. Her reflections on what we gain from failure - the lessons learned, a new perspective on our hearts, our spirits, our determination, and our lives - will encourage you to lace up your running shoes and head outside and choose adventure in your own life. Mirna just finished an epic race - the Transrockies Run, a six day stage race covering 120 miles across the Colorado Rockies - and it’s the most challenging thing she’s ever done. During this week’s new episode she shares with us what that race experience was like, what happened last year, and why she’s excited to challenge herself in new ways on this course next year. Mirna also opens up about the trans rockies community and how they helped push her to the finish line every single day. The love and respect that she felt from them made her want to continue and finish strong, even if she was the last finisher 5 out of the 6 days. The community around her didn’t care how she placed, they just cared that she finished. How incredible is that?! I know without a doubt that the community Mirna has built around her is a direct reflection of her heart, her kindness, and her willingness to put herself out there. It’s truly incredible who comes into our lives and who is there to support us when we’re willing to step into our most authentic selves. When Mirna started her blog in 2011 she had no idea that the life she’s leading now would be the result. She was just sharing stories about her experiences running - even more than that, she was inspiring others to get out there and start moving their bodies too. 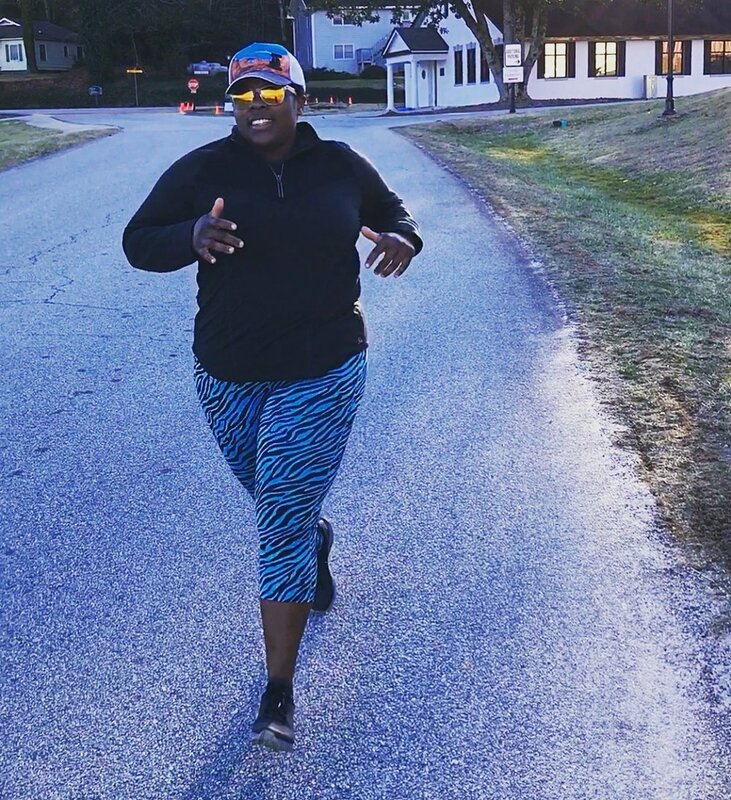 In 2014 she wrote a blog post that were hindsight reflections about what people say to her as a larger woman when she’s out running. This post started to get attention, and from there she started writing for trailandultrarunning.com, writing reviews, and over time building up a portfolio about running. Living life publicly and being so vulnerable has had its highs and its lows. Mirna is without a doubt redefining what athleticism looks like - she’s showing everyone that there’s more to athleticism than just what one body represents - but not everyone is on board with this. She’s been dealing with negative comments and trolls on the internet for years. Comments like “she doesn’t look like a runner” and “is this even possible?” have flooded her Instagram comments and e-mails. Mirna has learned how to deal with those comments - especially the ones that are incredibly hurtful, shaming, and negative. During this week’s episode Mirna opens up about the e-mail she received while she was out completing a race - and how that negative e-mail, and her response to it, inspired an article she wrote for Women’s Running Magazine, and how that is what inspired the REI Documentary. Mirna and I also chatted about body positivity, embracing the body that we’re in, and how we can continue to encourage women and men to step into their truth and be exactly who they are. You guys are going to love her words on this - trust me. Mirna is on a mission to empower women of all shapes and sizes to proudly embrace their bodies, expand their horizons, and own their truth. She unapologetically owns who she is, her joy, and her truth. When we live in our truth, we serve as an example (without even realizing it) for others to pursue their passions despite size, disability, or background. This year Mirna left her job teaching Spanish, running her school’s diversity program, and coaching cross-country to focus on running, writing, and speaking to continue spreading her message of body positivity and health no matter your size. She’s making adventure accessible to people who think it’s not accessible to them, and she’s still teaching - in her own way - and this conversation is one of my favorites by far. Mirna has unapologetically owned her joy, her story, and her truth - and you guys are going to fall in love with her. I cannot wait for you to check out this episode. Our second giveaway in our month of giveaways to celebrate the one-year anniversary of the podcast went live yesterday on our Instagram page! Thank you SO so much to all of the generous women and companies that participated in this week’s giveaway! Enter our week 2 giveaway here! To enter to win Baiser Beauty Revitalizing Face Oil, Nasty Woman Cosmetics Liquid Lipsticks, OSEA Hydrating & Age Defying Starter Set, Primally Pure Charcoal Deodorant, and Veque Nail Polish . . .
(1) Follow @seekthejoypodcast on Instagram (2) Like the post announcing the giveaway (hint: look for this photo right here!) and (3) tag a friend who would also love this giveaway. Bonus entries for (1) following @baiserbeauty @nastywomancosmetics @primallypure @oseamalibu @vequebeauty and (2) liking their three most recent photos. Enter as many times as you like, one friend per comment! This is not sponsored by Instagram.Giveaway closes 11:59pm PST on 10/12! One winner will be chosen at random and announced on 10/14.